100 posts in 2007 looked like a perfect number to be at whereas this post will increment it by 1. I am no fan of 101 mainly because it is so overused and beaten to death. I am rather lazy and I generally don't like my time to be governed by the calendar of events that abound in the blogosphere. I also have a thing against conforming. If everyone is doing it, I generally will not - unless something I do happens to fit into the broad scope of the event. Or it is something I truly enjoy. The event is usually an after-thought. Yet, 2007 saw me participating in many events out of my own free will. The first one being the March Against Plagiarism. That may have been a one day event but I have continued my efforts in my own way through the year, doing my best to create awareness of proper etiquette and best practices when it comes to using previously penned material as a basis for one's own post. The other two significant events have been NaBloWriMo and NaBloPoMo. The former in October and the latter in November. I started NaBloWriMo 11 days late but I made up all 31 posts by including the daily posts I wrote in November. There was no way I would have been able to write 31 posts in 21 days. While they qualify as posts, I didn't do any one-liners or posts with a single image and no words. At least I don't think I did! It was tough to write every single day and while there were the hecklers in the last row to be pandered to, I did it more for myself than for anyone else. And write I did - every single day - from Oct 11 through to November 30. Some posts were better than others; other posts were pretty pathetic. All in the day's work! 2007 also saw me venture out of my comfort zone into cuisines that I knew nothing about. My series on Native American cuisine was an eye opener and a rather satisfying journey on all fronts! I hope to continue exploring Persian cuisine through the coming year. I wish I could say that my blog is structured. That I have a definite posting plan or that I have a focused theme. I write about life in general, with food and conversations that happen along the way. Sometimes those conversations are downright hilarious, and other times, they are heart-wrenching and sometimes thought-provoking. And they are sprinkled all over my blog. My blog is unstructured because it is my playground. Where I can be unfettered and free. Very like Medha's weekends. I strongly believe that it is not just children who thrive on a good dose of unstructured time every now and then. So here's looking back at my posts in each month of the year 2007. Last-row hecklers, you may please stop sniggering as I am well aware that in some months there may not be many posts to write about! January brought us Nutty Green Beans. It was an exhausting month, with snowstorms dropping at least 6 inches of snow on us every week. While my husband enjoyed the mild winter in Bombay, I was out shoveling what seemed like endless fields of snow. 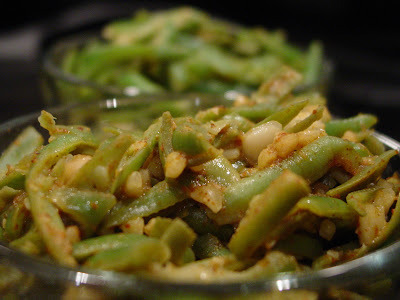 The Nutty Green Beans recipe is one of our all-time favorites and it also brings back memories of those lonely cold nights when the winds howled through the bare trees. We have lots of snow this winter, too, but - and this is a very important 'but' - I am warm during the day and at night! February was an eventful month! Indira launched Dining Hall and invited me to be an Administrator for the blog. 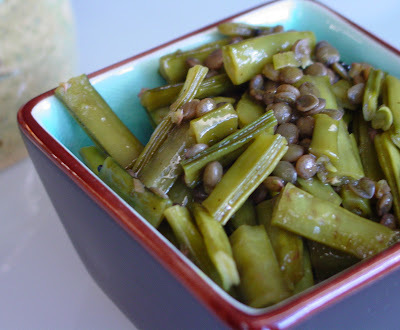 My husband returned from India to an earthy dinner of Cluster Beans with Puy Lentils as a substitute for kale vatane or black peas. 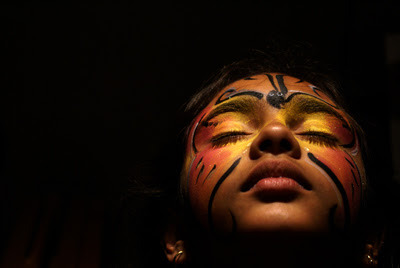 March is synonymous with Ammini Ramachandran on IFR. 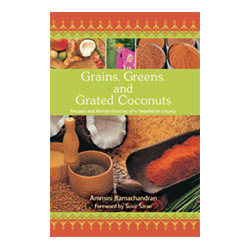 Ammini's cookbook Greens, Grains and Grated Coconuts, Recipes and Remembrances of a Vegetarian Legacy was released by iUniverse to rave reviews everywhere. This book is 'The Joy of Cooking' for vegetarian Kerala cuisine and Indian Food Rocks was honored to be the first food blog to review Ammini's cookbook. Paal paayasam kicked up quite a storm on more fronts than one! Yes, my favorite hecklers, you know what I am talking about! April marked the 4th anniversary of the first real post I made on Indian Food Rocks. May saw me take a vacation without my family, a first for me! My sister and I reveled in some alone time in San Francisco. 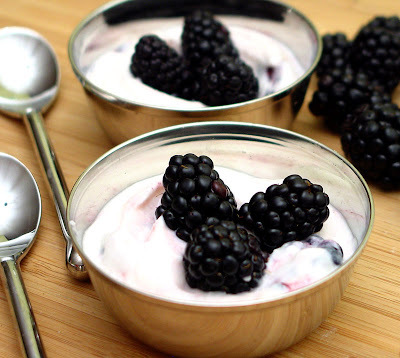 Before I went, I treated the family to a Very Berry Shrikhand, a fruity version of the shrikhand with blackberries. June saw me reminiscing further on my trip to San Francisco, especially our jaunt to Chinatown. And I lived up to my promise and reminded everyone that it was time to pickle those lemons and limes. My friend Lee lugged kale vatane all the way from Texas so that I could make the real chitkyachi bhaji! And we went off on one of my dream vacations: we drove through Maine to Halifax, Prince Edward Island and Cape Breton and back. 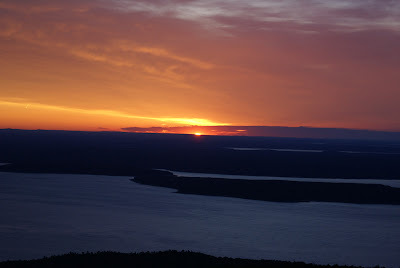 On our way there, we saw the most spectacular sunrise, a picture of which I uploaded - unedited - to my blog. July was hot, busy and leisurely at the same time! 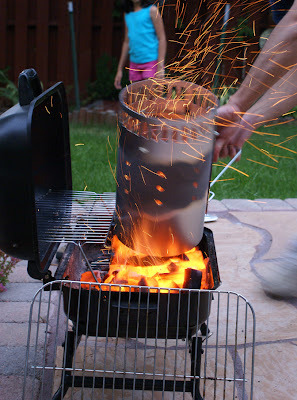 Quick meals on the grill were the norm. August had us hiking into the Rockies and enjoying local flavor. 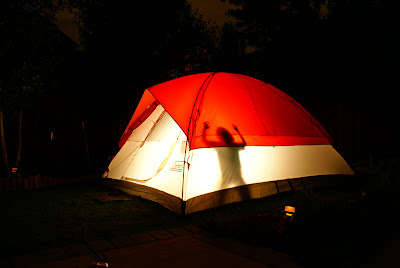 September was the month for the neighborhood camping trip in Moraine Park to hear the elk bugle. We practiced in our backyard and enjoyed some patal bhaji. October rocked! I turned 40, went on to win some really cool Click badges for my picture of a high-key egg and was also bitten by the NaBloWriMo bug. November was equally busy, if not busier than October! I jumped on the NaBloPoMo bandwagon and blogged like one possessed, dug into my archives - both food and photo - and churned out 30 posts! My picture of the wagon with red wheels from this post was Schmapped, much to my delight! 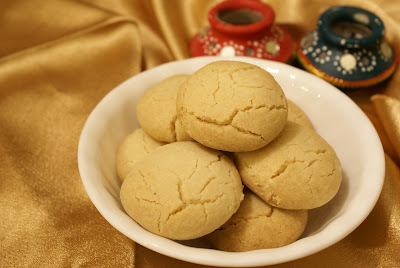 The biggest high of that month was when I found my Mom's recipe for nankatai. December saw me ease back from blogging and revert to an unstructured schedule. I was very touched when Medha wrote her note to Santa Claus and I felt really blessed and honored to be a part of her life. I thought I would take a break from Click but some things fell into place and I was able to avoid being a no-show. I hope you enjoyed reading my blog as much as I enjoyed writing it. It's been a very fulfilling journey for me. I have loved reading all your comments and feedback, and I have felt immensely important when you based your posts on mine. I have loved it when you made fun of me and let me have the same honor in return. I have made some very special friends along the way, some of whom I met, others whom I have talked to and many more that I have exchanged emails with or chatted with. 2008? Expect more of the same from me. 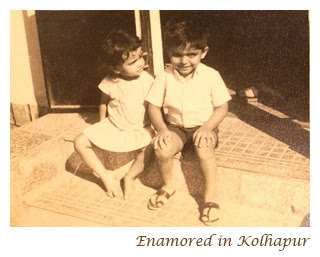 Where life takes me, what thoughts cross my mind, what Medha comes up with...I will share it with you! 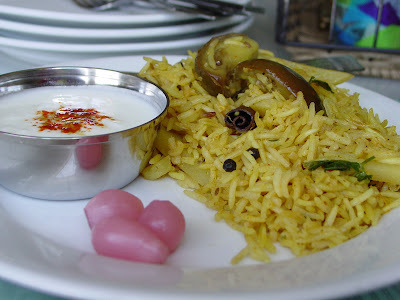 Thank you, Nupur, for inspiring me to look back on 2007 and what it meant for Indian Food Rocks and for me. 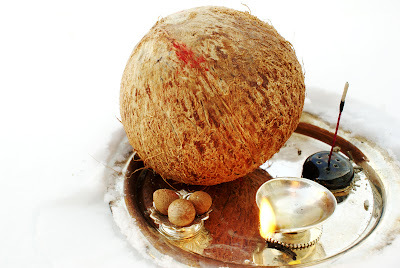 Ever wondered why the coconut plays such a significant role in most Hindu traditions? In rituals? In offerings to God? Someone had once told me the three eyes of the coconut represent the three eyes of Shiva, one of the three most revered Gods in Hinduism. Apparently, there is more to it, according to this FAQ. The coconut is broken, symbolising the breaking of the ego. The juice within, representing the inner tendencies (vaasanas) is offered along with the white kernel - the mind, to the Lord. A mind thus purified by the touch of the Lord is used as prasaada (a holy gift). Most rituals usually have a sound basis in either logic or economics. I think this holds true when it comes to the coconut, too. Kalpa vriksha is the Sanskrit word for the wishing tree or the tree of life. I have seen this meaning extended to the coconut tree because nearly every part of the palm tree can be used and the tree has a high annual yield of the sustaining fruit. We grew up on and with coconuts; literally, every part of the fruit. Water from young coconuts was a thirst quencher during hot and humid summers. The tender flesh within, a treat to slurp once the water had been downed. The water from the mature coconut was also popular but not as much as that from the young tender coconut. The husk and shell was used in outdoor stoves as fuel. The white flesh was grated, ground and 'milked' and converted into the base for our curries. After all, what is fish curry without coconut? Fresh grated coconut is the most common garnish where I come from and definitely more popular than just cilantro. Dried coconut was also used in curries but more so in dry chutney powders like Lasnichi chutney. Steel wool and scouring pads were preceded by the more environment-friendly coconut husk to scrub utensils. This is just the tip of the iceberg. It's not much of a surprise that the coconut is a revered and considered an auspicious fruit. But betel nut? Betel nut or supari is known for being a mouth-cleanser. According to the Ayurveda, it is supposed to have medicinal properties as well. The leaves of the betel plant are used to make tambulam on special occasions and are also presented as a parting gift to visitors. Betel nuts can be chewed for their effects as a mildly euphoric stimulant, attributed to the presence of relatively high levels of psychoactive alkaloids. Chewing it increases the capacity to work, also causes a hot sensation in the body, heightened alertness and sweating. The betel leaf is also used to make paan. In Hindu tradition, betel nuts represent the deities. The worshipper provides seats of rice grains to these deities and installs them on the seats. The following should be the arrangement made on a raised wooden seat. Betel nuts representing deities are kept on betel leaves. This is the most I have been able to find when it comes to tradition and religious ceremonies. If you can shed more light on why betel nut is considered auspicious, please do let me know! 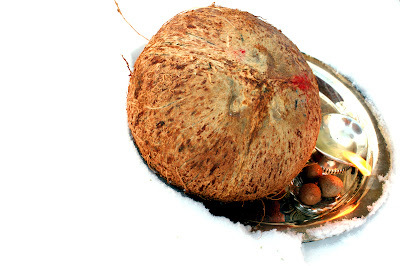 Coconuts, betel nuts, a diya and an agarbatti in the snow?! More than a little incongruous. Slightly crazy, too, especially on a particularly windy day! But it all makes sense as this is is my entry for CLICK, a theme-based monthly food photography event. The current theme is nuts. 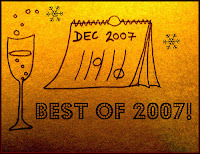 The deadline is December 30, 2007 so if you haven't clicked yet, hurry up and send in your entry. The rules are here. Some cool reflections. You can see Jeffrey the snowman in the large view. We're in the grips of several dilemmas. Medha finally wrote her note to Santa and it reflects the turmoil within her. She's the only one - or so she thinks - without a Webkinz. She has access to the web site through her cousin, who has a Webkinz collection but she still wants her own. She doesn't know it but she is getting a Webkinz. From me. Santa is going to give her gift away to someone who needs it. We have a child in mind and we are going to make sure that Santa will do the needful over this Holiday season. Until a few years ago, Medha was always happy with the gift that Santa brought her. It was the only gift she received for Christmas. She never thought of comparing notes with any of her friends. Over the last few years, she was made to realize that Santa Claus brought her friends not one but two or three gifts, one at each house they lived in. Then they also got gifts from their mother, their mother's boyfriend or husband, their father, their father's girlfriend, grandfathers, grandfather's wife or girlfriend, grandmothers, grandmother's husband or boyfriend, great-aunts and uncles, and so on. What made it worse was the nature of the gifts. People who were normally sane and held fast to all sorts of values, went berserk over Christmas. Her friends almost always got more than one American Girl doll. And, what did Medha get? One gift. That was it. We talked this over and she understood everything I said but she remained morose. So we decided to start giving her a gift each year. That is why this is a huge milestone for her. From this year forward, Santa will give her gift to a child more needy than her but she will stil get a gift from us. She may get a Wii but it's something she will have to share with her father. I think he wants it almost as badly as she does! The Webkinz is just so that I don't hear any more whining about who has how many and how she has none. I am hoping that in another year or so, she will be willing to let go of the gift we give her, too. This gorgeous young spruce was delivered today. But where am I going to plant it once the season is done? I don't have room in my tiny yard for another spruce that will eventually grow to be 8 feet tall and 5 feet wide. I am going to offer it to my neighbors and if there are no takers, then I will have to just donate it to someone who could do with a spruce in their yard! Aren't we lucky? This is all we have to worry about. Yes! It's time for Secret Santa, already! Some of you might remember the nameplate that Medha and I made last year. And the Secret Santa game that the kids in the neighborhood play every December. We pulled names for each of our kids when we went for the gals night out at Juju Beads, in downtown Louisville. And, I pulled a boy's name. But it's not that bad cos she tolerates older boys better than younger boys. Um, maybe that's not such a good thing! But this kid is a good kid. He even plays chess! So two homemade gifts need to be made and delivered secretly; the final gift (under $10 or is it $15?!) 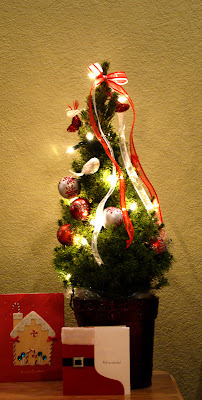 to be kept under the tree on the day of the party. What does one give a boy?! You can't give him a beaded necklace or earrings! A nameplate would just give it all away. He is Jessie's older brother. All the artsy-crafty stuff would be lost on him. Boys like food, said Medha. She remembered selling him snow cones for $1 in summer. Why don't we bake cookies? Yes! 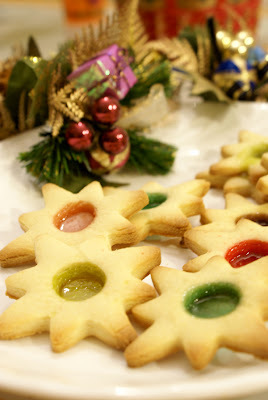 And, a perfect time to try the Stained Glass Cookies that I have been seeing in my dreams, ever since I saw Deeba's cookies on Susan's Christmas Cookies from Around the World event. 10-12 brightly colored Jolly Ranchers or Lifesavers or any other hard candy, crushed. Ensure all ingredients are at room temperature. If it's winter and you have your heat set to 69F, then - like Medha - you, too, might wonder what room temperature means! Cream the butter and sugar together until it is smooth. Add the salt and vanilla extract and beat till mixed. Add the egg and beat till well mixed. Mix in the flour to form a firm dough. If you are doing this part by hand, then gather it together firmly and knead it a little bit to bring it together. Otherwise, it will fall apart and it will be difficult to roll it out later. 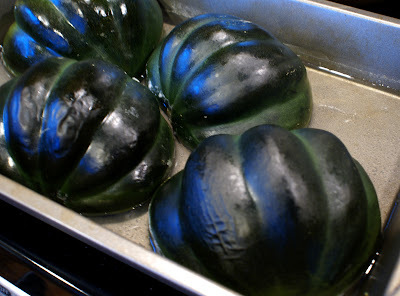 Press the dough into a rectangular shape, wrap it in plastic wrap and chill it for at least 10 minutes or so. While the oven is pre-heating and the cookie dough is a-chillin', separate the Jolly Ranchers according to colors and put them in baggies. Crush them using your mortar-pestle. Or just hammer them with whatever works for you. A mallet, maybe? Line your cookie trays with parchment paper. Cut the dough into thirds and roll it out to about a quarter inch thickness. I had to knead my dough a little bit to make it easier to work with. 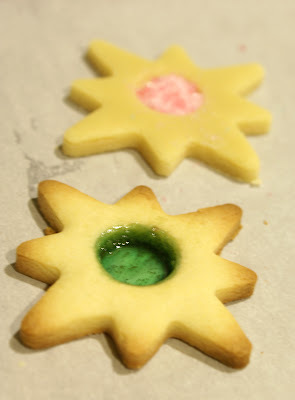 Cut with your favorite cookie cutters. 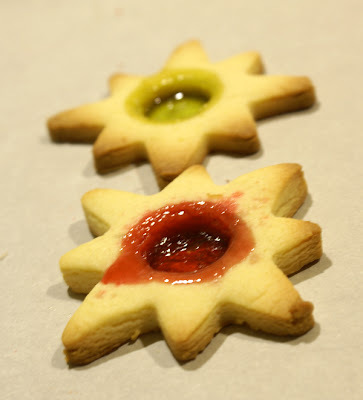 Cut out smaller shapes, but not too small, like triangles or circles or hearts from each cookie. 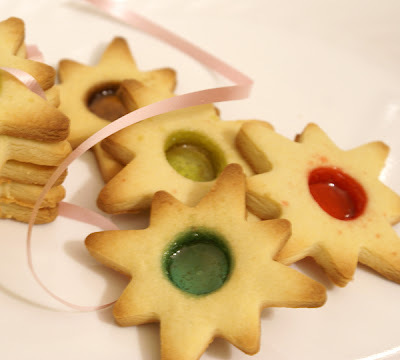 Transfer the cookie to your baking tray and fill each cookie with different colored crushed candy. Bake for 10 minutes. 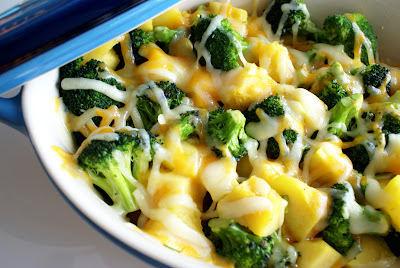 Pull out the tray if you see them getting too brown. It's way cool to see the melted candy bubble away in the oven! Remove the tray from the oven and let the cookies cool on the tray for a couple of minutes. If you see gaps in the melted candy, use a toothpick to spread it before it cools and hardens again. Transfer the cookies along with the parchment paper to a wire cooling rack. Peel off the parchment paper only when completely cooled. This recipe makes approximately 4 dozen 3" cookies. Less if you use an assortment of shapes and sizes. The cookies were delivered on Monday right after school in an unassuming brown paper bag, with a thoughtful note explaining that these were basic sugar cookies with melted Jolly Ranchers. There were no escapades like those from last year or the previous year. And I am very relieved because we had a storm over the weekend that dropped about 4-5 inches of snow and the sidewalks were icy from the thaw and freeze. We didn't know how much candy we could use to fill up each cookie. The first time the girls did it, they used very little candy. Part of the problem was also that the cut-outs were rather small making it difficult to fill. So no amount of spreading with a toothpick would help. 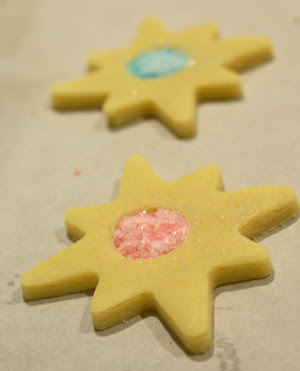 In the next batch, we stayed with the star shape and heaped the candy. You don't want to do that as the candy bubbles over onto the cookie itself. Tastes just as good but doesn't look quite as pretty. 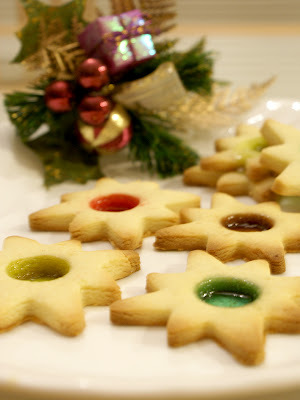 These cookies can be used to decorate your tree, too! If you want do that, make a small hole at the top with a straw. I don't particularly like to adorn my tree with edible stuff so we passed on this. 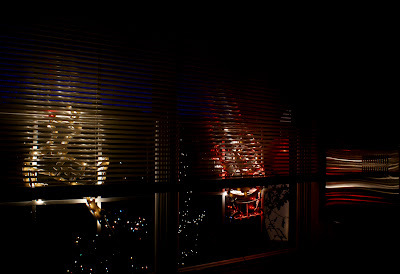 The party is next week and we are the hosts this year. The kids usually make gingerbread houses or forts. Some come up with outlandish designs. Medha has never been able to erect walls that stand up for more than 2 minutes. So she has a pile of graham crackers, lots of frosting and decorations. Some of the children eat their gingerbread houses. Most of it is destined for the trashcan. I wish I could say I like this part of the event but the truth is that I don't. It's the only part I have an issue with. Medha is playing a variation of this at school, too. Secret Snowpeople, they are called. They have to bring in something special for their Snowperson. It could be a cinquain or a couplet that they wrote specially for their Snowperson. It could be a snack or a craft. They will do this for 3 days and the final gift, which will be shared on the day of the Holiday party, has to be under $5. I guess I will be baking a lot this weekend! If the schools acknowledge that religion exists, our children will grow up to be more accepting of others' beliefs. I am not saying that the onus of teaching religion should rest with the schools. What would help a great deal is acknowledging that there are several paths to God and maybe not, for those who don't believe in God. I am really happy about some of the changes I have seen that I believe will lead to more acceptance and tolerance of cultural and religious diversity. In the past several months, Medha has come home with books from the library about Diwali, Eid, Hannukah and Kwanzaa. They get Time for Kids in school and one of the issues focused on India and its heritage. The Kindergarten teachers in her school are putting together a talk about different cultures and traditions. I might be asked to talk about Diwali. As you can see, winter has really set in this year. We have already seen about 10 inches of snow. Over the plains in Kansas, they have been dealing with ice. I think we all need a Secret Santa to bring us some warmth! The kids in Lesotho could certainly do with a Secret Santa who makes it possible for them to have a warm, nourishing lunch at school every day. It's been proven over and over again that food keeps the children in schools, ensuring that they get an education along with the nutrition. If you haven't already donated for Menu For Hope, please consider sharing some of the warmth in your homes with these children in Lesotho. 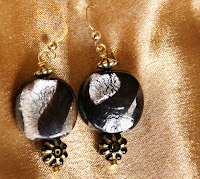 Check out the prizes I am offering, along with Ammini Ramchandran. See what other bloggers are offering. This is an excellent cause and every $10 will buy you a raffle ticket for all these fabulous prizes. Think about. Consider it. And, be a Secret Santa. It's that time of the year when everyone goes nuts trying to lay their hands on those 4 GPS systems that were marked down from $500 to $199. Or looking for that ever elusive Wii. When we stand in never-ending lines or in short lines that never move because everyone ahead of you bought out the store. We've been trying to tell Medha that she should think about those children in this world that are not as lucky as her. For whom, gifts at Christmas are an aberration because they don't have enough clothing or food to sustain them through their day. She feels deeply for those children but she is a child herself, and so she swings back to wanting one last thing from Santa this year. A toothfairy hangover perhaps. We want it to be her decision and I am hoping she will make the right one. If she does, we will donate the money to a worthy cause. And I figured what better cause than Menu for Hope 2007, an annual fundraising hosted by Pim Techamuanvivit, on her food blog Chez Pim. Five years ago, the devastating tsunami in Southeast Asia inspired me to find a way to help, and the very first Menu for Hope was born. The campaign has since become a yearly affair, raising funds to support worthy causes worldwide. In 2006, Menu for Hope raised US$62,925.12 to help the UN World Food Programme feed the hungry. 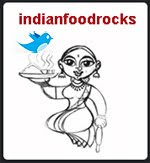 This year, Indian Food Rocks joins Menu for Hope to raise money that will be go directly to the UN World Food Programme. This year the funds raised by Menu for Hope will be earmarked for a school lunch program in Lesotho, Africa. The campaign will run from December 10-21. Indian Food Rocks is happy to present two prizes to help raise money for this effort. A donation of $10 entitles you to a raffle ticket to a prize. 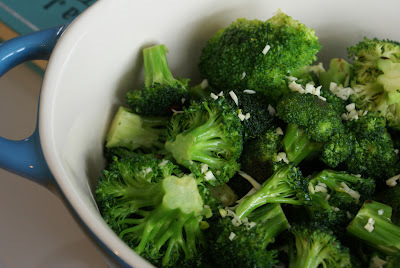 Readers of my blog need no introduction to Grains, Greens, and Grated Coconuts. It is the perfect cookbook to curl up with and experience vegetarian Kerala cooking from India at its best. It is a cookbook that I turn to several times a week for simple and tasteful vegetarian recipes. Ammini writes with a lot of passion and attention to detail. 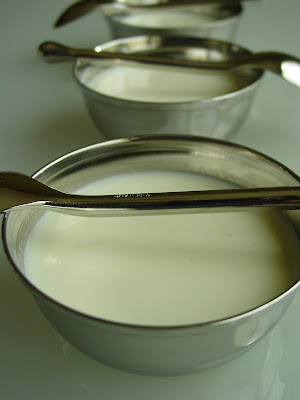 Most recipes are accompanied by a snippet of history or a personal anecdote. An autographed copy of this cookbook has been generously donated by the author, Ammini Ramachandran. This prize can be shipped only within the continental USA. 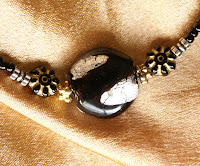 I made this beautiful necklace and matching earring at a local bead shop last weekend. 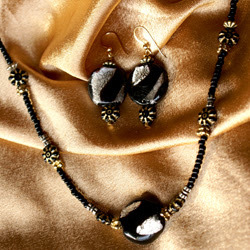 I carefully chose each bead and this is a one of a kind necklace and matching earrings will stand out at any black dress party. 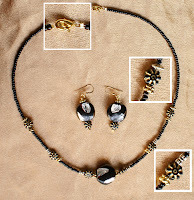 Here are some more pictures of the necklace and earrings. Click through to see the larger image. Menu for Hope is now live! Choose a prize or prizes of your choice from our Menu for Hope at Chez Pim. Note the prize code(s). Go to the donation site at First Giving and make a donation. Remember that this money goes directly to the UN's WFP without going through any of the bloggers promoting this event. Please specify the prize code(s) for the prizes you would like in the Personal Message section in the donation form. You must specify how many tickets per prize, and use the prize code. Each $10 you donate will buy one raffle ticket toward any prize.For example, a donation of $50 can be 2 tickets for EU01 and 3 tickets for EU02. Please write 2xEU01, 3xEU02. Please check the box to allow us to see your email address so that we could contact you in case you win.Your email address will not be shared with anyone. A special thank you to Kalyn of Kalyn's Kitchen for being the gracious host for US Central. Before you make your contribution, I would ask you to spend some time on some really moving images captured by the children of Lesotho that are now available on Pim's blog.